Anyway, New Year’s eve calls for celebration. Whether you are out and about with friends, partying into the new year, or at home, having fun with family, nobody goes through the midnight hour without celebrating.. So this year, we had a small family get together at home and being the baker of the family, I was put to the task of making a cake. 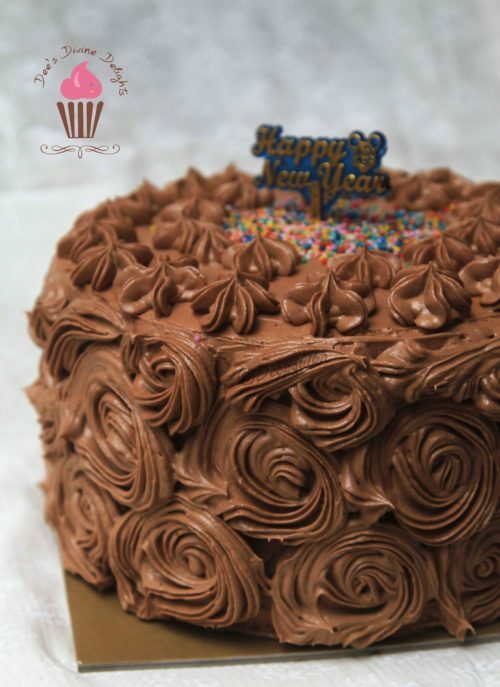 Which was easy because I had already made up my mind when the recipe for this Neapolitan Cake was posted in the Fondbites group back in November, that this would be my new year cake! Just looking at the layers made me drool. 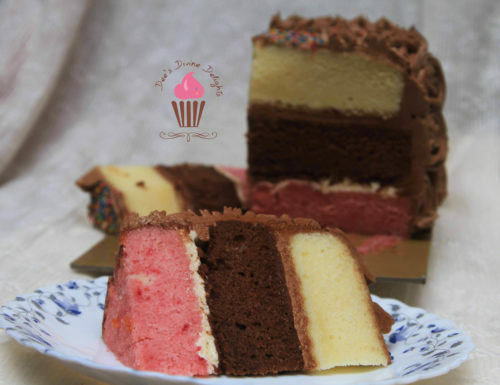 I was fascinated with Neapolitan Cakes from the first time I laid eyes on them, back when I started baking. Every baking blogger worth their salt (sugar?) has made this or some variation of the cake. 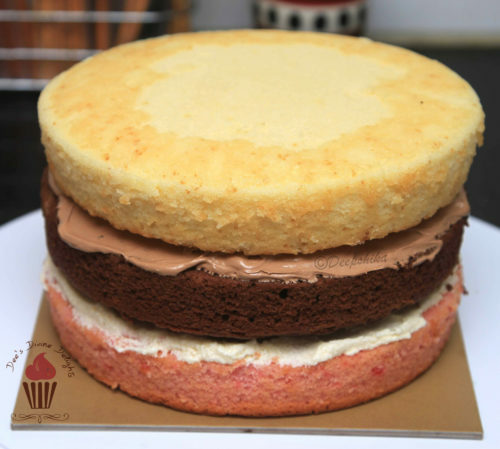 Though I am not much of a History person, I really wanted to know why this cake is made the way it is- Vanilla, Chocolate and Strawberry and why is it called Neapolitan? I did some digging around and came to a satisfactory conclusion. Neapolitan means “originating from Naples- a city in Italy (known as Napoli in Italian)”. 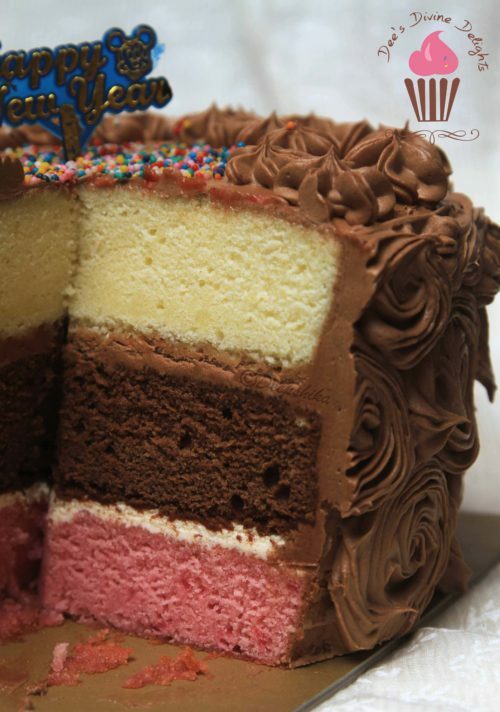 The Neapolitan cake is actually derived or rather inspired from Neapolitan Ice-Cream. Yes, the flavors were originally an ice cream. There is no evidence or proof to show that the ice cream originated from Naples. In fact, the ice cream was more famous in Paris than in Italy. But at the time (19th century I gather) the Parisian ice-cream makers were none other than Italians, especially Neapolitans. So, the name. After inventing gelato and ice cream, the ice-cream makers were set with the difficulty of creating something new. They came with the idea of combining different flavors into one ice-cream. The term Neapolitan was generally used to describe any ice cream combining 3 flavors. Initially the flavors used were- Pistachio, Vanilla and Strawberry (or Cherry) to represent the Italian Flag. But as time passed, the more popular flavors at the time took over and became the unofficial Neapolitan flavors. Still, there is no official flavor combination for this intriguing dessert but now the Neapolitan Ice-cream and from that the Neapolitan Cake are known for this trio – Vanilla, Chocolate and Strawberry. 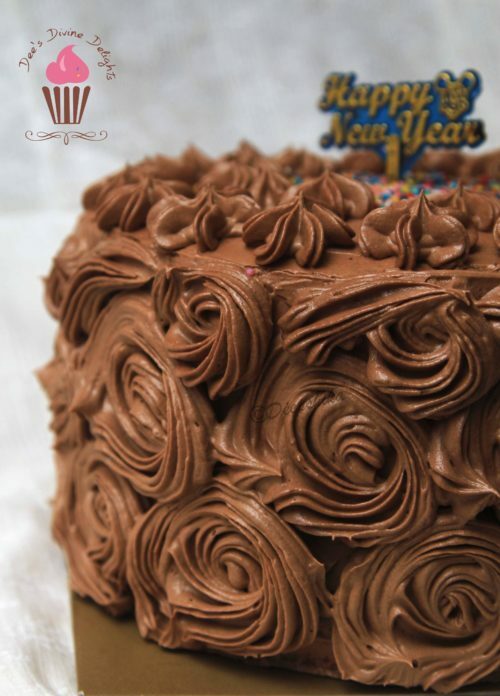 I used Nutella frosting to frost the cake because the children in the family are huge chocolate lovers and I didn’t wanna overpower the other flavors of the cake by using chocolate frosting. So I settled for Nutella, a win-win. The children were also satisfied and I too felt the frosting complimented the cake in a strange way. But I definitely wanna try it with the custard cream used in the Fondbites recipe. I am sure that would allow us to taste the flavors of the cakes better. 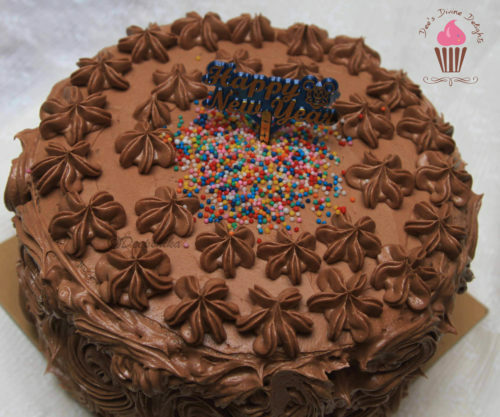 For filling the cake, I used the same nutella frosting in one layer and some Cooked flour frosting I had left over from another cake I had made, to take some of the attention away from the nutella..! Please don’t worry- I have not taken up a sudden liking to History. Just thought I will make the first post for the New Year a little interesting 😉 Hope you liked reading it as much as I liked gathering the information. And again A VERY HAPPY NEW YEAR!! Information I have provided here is taken from a lot sources over a period of time. The main sources being: Of Sugar and Snow: A History of Ice Cream Making, CakeSpy, eHow, Wikipedia and a few more.